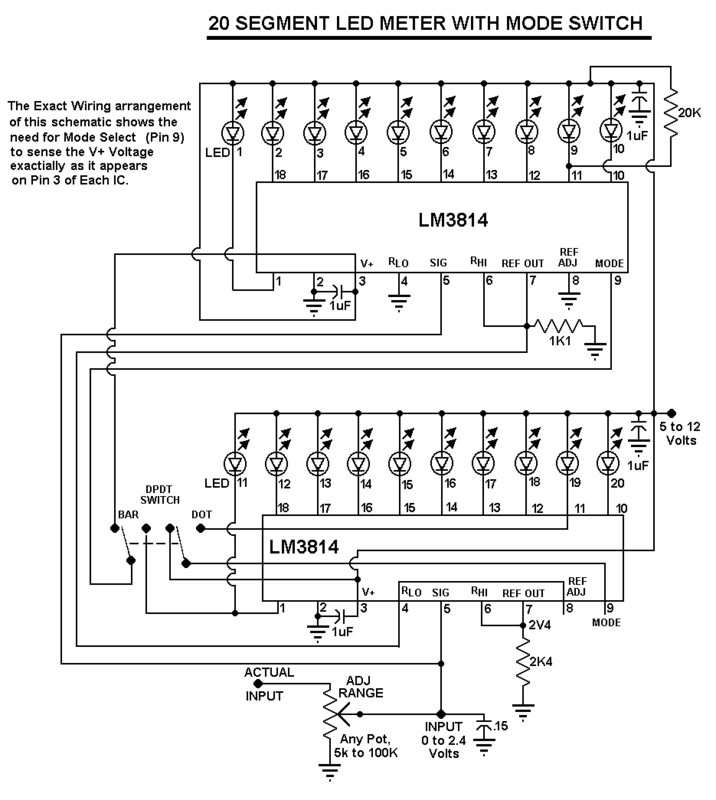 These are Basic Expanded Voltmeters based on the National LM3914 chip. They can be Switched to either Bar or Dot Mode. adjusted to Much Higher voltage ranges with the input potentiometer. 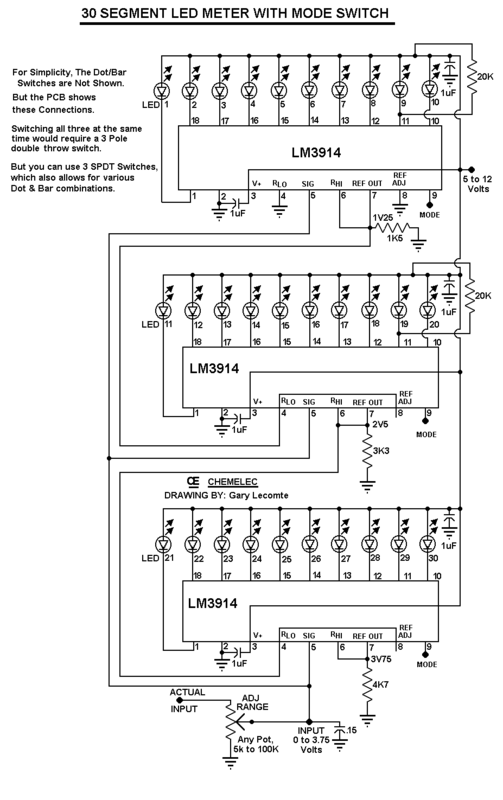 DO NOT EXCEED 30 VOLTS to PIN 5 of the LM3914's. requested by one of my readers. are lit up in Dot Mode. This 20 K resistor is soldered to the Copper Side, due to space limitations! All Capacitors Should be Tantalums, A Recommended by National Semiconductor. I designed The 20 LED unit to operate from any Voltage Supply beween 5 to 12 volts MAXIMUM. 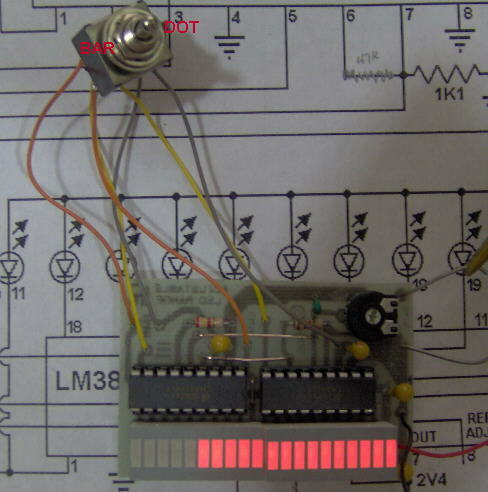 In Dot Mode you can Safely operate this circuit up to a 20 Volt supply. By Reducing LED Currents, These units can be operated at 15 Volts in Bar Mode. This NEW, Three LM3914 Version (Shown Below) has a Minimum 3.75 Volts for full Scale. BAR Mode, without damaging the LM3914's. I can supply the LED displays as shown, they are listed in my "Parts" area. Look at "LED's, Bar Displays"
They are $1.50 each plus Shipping Cost. 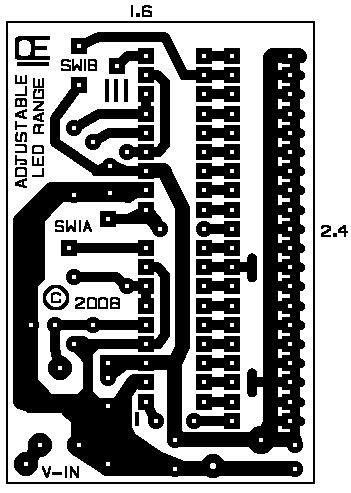 The PCB and All the other parts are also available from me. Postage cost on these parts depends on total weight and where you live. These prices are based on US Funds. 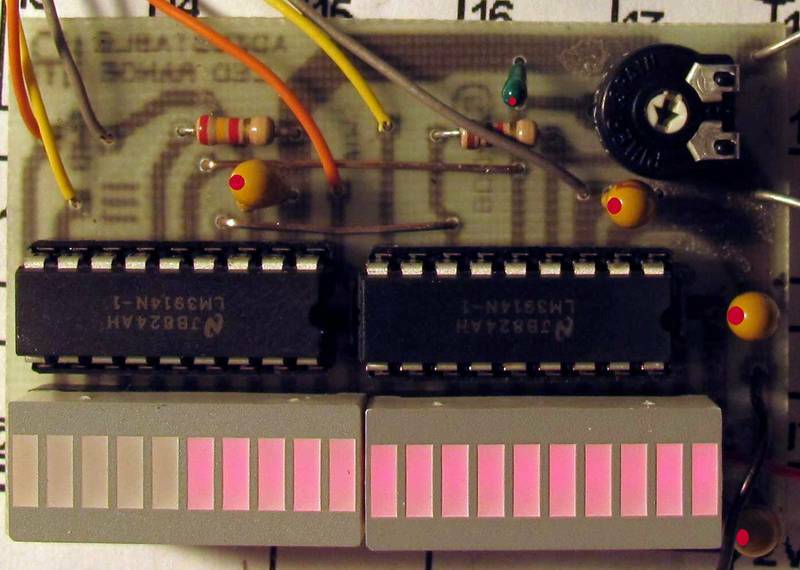 A 30 LED Version,  Shown in Dot Mode. The 30 LED, Circuit Board.